“This is no ordinary lawsuit,” begins Judge Ann Aikens, United States District Judge, in her decision to DENY a request to dismiss a lawsuit brought by 21 young people, Earth Guardians (an association of environmental activists) and Dr. James Hansen (climate scientists, acting as “guardian for future generations”) against the President of the United States, the Environmental Protection Agency, the Office of Science and Technology Policy and the Departments of Energy, the Interior, Transportation, Agriculture, Defense and State. Yes, you read that right. Filed in 2015, the lawsuit “Juliana vs USA” alleges the United States has known for more than 50 years that carbon dioxide from burning fossil fuels destabilizes the climate system in a way that significantly endangers the young people filing the lawsuit, with damages that would persist for thousands of years. Even as this was known, the USA failed to act and deliberately allowed atmospheric carbon dioxide concentrations to escalate to levels unprecedented in human history. This climate damage, the case argues, violates the young people’s constitutional rights to life, liberty, and property. The government has not upheld its responsibility to protect essential public trust resources. A trial date is set for February 5, 2018 at the U.S. District Court of Oregon. In July of 2017, the Trump administration submitted a petition for writ of mandamus, which basically claimed that the lower court had failed in its duties when it denied the request to dismiss. The Administration asked that the decision be overturned. Hearings about this new request to dismiss were held in December 2017, in front of a three-judge panel. At least two of the three judges are reported as expressing skepticism over the request to dismiss. A decision has yet to be reached, but in a strange twist, one of the three judges—and the one whose questions appeared to be most skeptical about the young peoples’ case—retired abruptly after sexual harassment allegations. To explain the details of this riveting case of extraordinary promise, called by some the trial of the century, Sophie Kivlehan, one of the young plaintiffs holding a front row seat in this extraordinary landmark case, will be the speaker at MAREA’s January 30 TEK Park meeting. 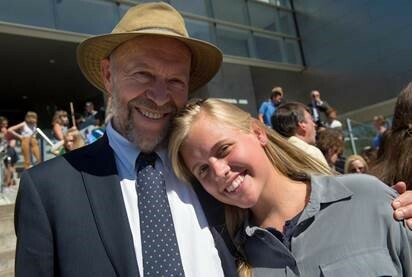 Now a first-year student at Dickinson College and an activist in her own right, Sophie is also the granddaughter of James Hansen. It was his testimony, as director of the NASA Goddard Institute for Space Studies, to federal congressional committees in the 1980s that marked the beginning of public awareness about global warming and climate change. In her talk with us, Kivlehan will explain the details of the lawsuit and its potential to help the “situation” (as she gently puts it) and about other actions needed to ultimately “turn the ship.” She has gained a remarkable reputation for youthful optimism and level-headed candor about climate change causes and solutions. (Sophie Kivelhan Doesn’t Want You to Freak Out, the Weather Channel) We look forward to hearing her special perspective firsthand. We are honored and delighted to have Sophie Kivlehan as our inaugural speaker for 2018 and hope you can join us! All are invited. Our meetings are free and open to the public. The meeting is Tuesday, January 30, at 7:00 at TEKPark (9999 Hamilton Boulevard, Breinigsville, PA 18031, between Kutztown and Allentown). After the meeting, please plan to stick around and chat with friends old and new. Light snacks will be served. Hope to see you there! Sophie Kivlehan is a first-year student at Dickinson College, intending to major in Biochemistry and Molecular Biology with a minor in Spanish. Her goal is to spread this climate change awareness to young people, and have them realize that they are “perfectly able to fight for their future against double-dealing politicians.” Having grown up with a knowledge and understanding of climate risks imparted by her grandfather James Hansen, Sophie now works side by side with him in a special intergenerational partnership to educate and advocate for climate action, including their work with Our Children’s Trust and recent appearances together at COP23. Need a gift…but don’t want to buy stuff? If you’d like to make a donation to MAREA or buy someone a membership as a gift, let us know and we’ll handle the acknowledgement thoughtfully, by email or paper mail, with your input. Drop us a note at hello@themarea.org. And remember, all new memberships get a free copy of the DVD, “Saving Sunshine”! MAREA is a 501(c)3 non-profit. Donations and memberships are how we keep the lights on. You can join at the meeting or anytime online. Thanks for your help.